As small businesses grow, keeping up with accounting, tax and financial reporting becomes an increasingly time consuming and complicated task. 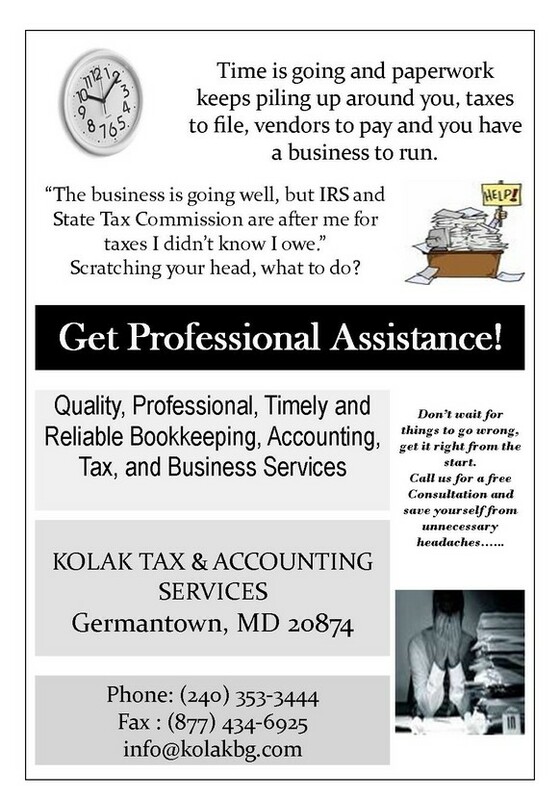 At Kolak Tax and Accounting, our services extend beyond organizing receipts and preparing tax returns to developing effective accounting and tax strategies for standardizing transactions and maximizing efficiencies. In conjunction with the accounting strategy, strong repeatable financial reporting processes are vital for the small business owner to capitalize on business deductions, reduce waste and avoid costly financial mistakes. We focus on providing the best and most cost efficient services for our clients based on their specific needs and applicable regulatory guidance for the industry in which they operate. We have experience in all aspects of taxes and accounting; tax planning, tax resolutions, compilation and review of financial statements, accounts payable, accounts receivable, general ledger, payroll, asset management, job costs, and analytical procedures. Kolak's accounting and financial reporting expertise will ensure that your business accurately records its accounting transactions. As a member of your business team, Kolak will be a trusted partner, providing sound advice on your accounting, tax and financial reporting needs. Our goal is to make your financial systems work better for you.